Meniscus repair is not as common as a meniscectomy when it comes to sports injury surgeries. This procedure attempts to save the cartilage in the knee, and can provides better long term health of the knee. In order for a meniscus repair to be successful, the torn portion of the meniscus must be in an area with good blood supply and the ability to heal. The meniscus is a circular shaped cartilage within the knee that sits between the femur and tibia and provides shock absorption. 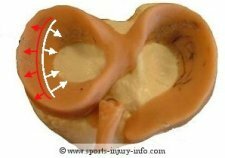 The blood supply to the meniscus is much better towards the outsde of the meniscus and diminishes as you move closer to the center of the joint. Tears that are located in the periphery (red arrows) where this blood supply is good, have a better chance for healing. Tears towards the middle of the joint (white arrows) along the thinner inside edge are less likely to heal. During an arthroscopic evaluation, your physician can determine where the tear is located, and if it is appropriate for repair. Your mensicus repair surgery will start with an arthroscopic evaluation. During this time your surgeon will evaluate all of the structures within the knee joint, looking for areas of damage. They will also probe the meniscus and find the torn areas. If the tear is in the red-red zone, then they can repair it. Otherwise, they will perform a meniscectomy and remove the torn parts. To repair the meniscus, your surgeon will use either sutures, or small bio-absorbable tacks to repair the meniscus. Depending on the size of the tear, it may take one, two, or more sutures or tacks to bring the pieces of meniscus back together. Once the repair is complete, the meniscus is evaluated again to make sure that the repair is adequate, and then they will close the portal incisions with sutures or staples. Recovery after a meniscus repair surgery is different from a meniscectomy. The biggest difference is that you will need to be on crutuches for several weeks, usually 3-6 depending on your surgeons preference. This time of non-weightbearing is critical for a successful surgery. 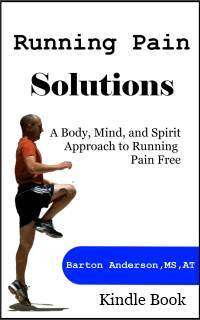 You have to give your meniscus time to heal and for the repair to take. The biggest mistake people make is putting weight on the knee before it is ready. Remember, the meniscus sits between the femur and tibia and is there to provide shock absoprtion. When you put weight on your leg, the meniscus will compress between the two bones. When this happens, the area that has been repaired can be pulled apart if it isn't healed. Aside from the time on crutches, recovery from a meniscus repair surgery is very similiar to a meniscectomy. Rehabilitation after surgery is important to restore range of motion, strength, balance, and endurance. A full recovery occurs around 2-3 months after surgery, depending on how long you are on crutches. Meniscus repairs are not as common as meniscectomies, mostly due to the locations of the tears and their abilities to heal. After surgery you will be non-weightbearing on crutches for 3-6 weeks, and then begin working on range of motion, strength, and balance. Full recovery occurs in 2-3 months. Meniscus repair is a good option for saving meniscus tissue and for long term knee health.